THE Iberian peninsula was conquered and settled many times, but only one of those conquests was a long-term linguistic success. The languages of the Celts and the Iberians left little mark on Spain. The Phoenicians were no more successful, although they bequeathed a memorable nickname to posterity: I-shepan-ha, “land of hyraxes” (more familiar as Hispania). The Romans had better luck. Their soldiers’ and settlers’ vulgar Latin (always distinct from the written, classical kind) spread to the masses. The overrunning of Spain by Germanic-speaking Goths failed to root out that rustic Latin. Nor did the long-term Muslim conquest of “al-Andalus”, beginning in 711 and continuing until the fall of Granada to Christian monarchs in 1492. Arabic gave many words to the local Castilian, but never replaced it. Nor was it ever obvious that Castilian would one day become Spanish. Of the kingdoms that reconquered Spain for Christianity, Castile was one of the least important. Neighbouring Asturias and Navarre were originally much bigger. But Castile’s place astride the pilgrimage route to Santiago de Compostela helped it grow richer and more important, and after its merger with Léon it leapfrogged the others to lead the reconquest. This and much more is recounted with good cheer in “The Story of Spanish”, a popular history by Jean-Benoît Nadeau and Julie Barlow, a Canadian couple who have written a similar history of French. Combining academic research with interviews on their travels, they tell the story of how a modest northern Iberian dialect became mother tongue to over 400m people. They have collected some interesting linguistic titbits. Castilian was probably influenced by Old Basque. Old Basque had no f-sound, which is why Latin ferrum became ferro in Italian and Portuguese but hierro in Spanish. The simple sound system is probably a result of Castilian’s quick rise, when many speakers would have learned it as a second language, shaving away complexity. And the straightforward writing system (almost any word can be read aloud accurately by anyone who knows the rules) is the result of unusually early and sustained efforts to impose a logic on the language. King Alfonso X (1221- 84) vigorously promoted scholarly translations into Castilian as well as Latin—a rarity in his time. And Antonio de Nebrija (1441-1522) wrote a Spanish grammar (in Latin), the first systematic treatment of a vernacular European language. The development of the language was uneven. Even at the height of Spanish power in Europe from 1500 to the mid-17th century, Spanish never became as prestigious as French or English would later. It never even conquered its own peninsula: Portuguese and Galician (a close relative), Basque and Catalan are vibrant to this day. In the Americas, it would take centuries for Castilian to become universal. The Jesuits, keen linguists, preferred to preach in Nahuatl, Quechua and Guaraní, the better to convert the natives (and to increase their own influence). But Spain expelled them from the Americas in 1767 and tightened its grip on the colonies over the 18th century. This strengthened the position of Spanish, while ultimately stoking the Latin American revolutions of the early 19th century. The official tongue of nearly two dozen countries, Spanish is one of the most important languages in history—but it punches far below its weight. Writers like Jorge Luis Borges, Gabriel García Márquez and Mario Vargas Llosa have done well at high culture, and low culture from salsa to schlocky soap operas are popular exports. But Spain began its decline early and Latin America stagnated under dictatorship for much of the post-colonial period. 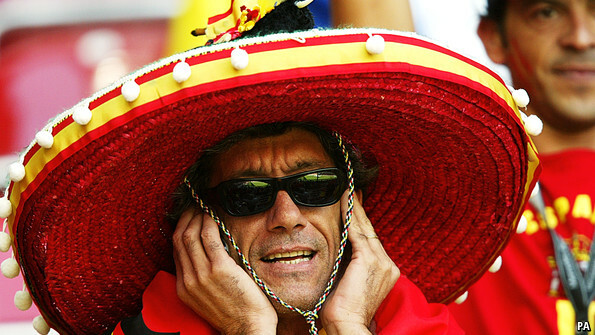 Spanish now lags far behind its close rival, French, in diplomatic use. More patents are filed in German, which has far fewer speakers. And Spanish is widely learned as a foreign language in just three countries—Brazil, the United States and France, all of which border on the Hispanophone world. Although it is a single language, Spanish varies considerably. This befuddles advertisers who would aim to sell to the entire Spanish-speaking world, like the shampoo-maker who discovered that cabello chino (“Chinese hair”) means curly hair in almost all Latin America save Ecuador, where it means straight hair. The official language academies of the various Spanish-speaking countries are now working together to smooth out the most disruptive differences and create a kind of “general Spanish”. If this linguistic bonhomie is accompanied by economic and political co-operation, Spanish can look forward to a bright 21st century.